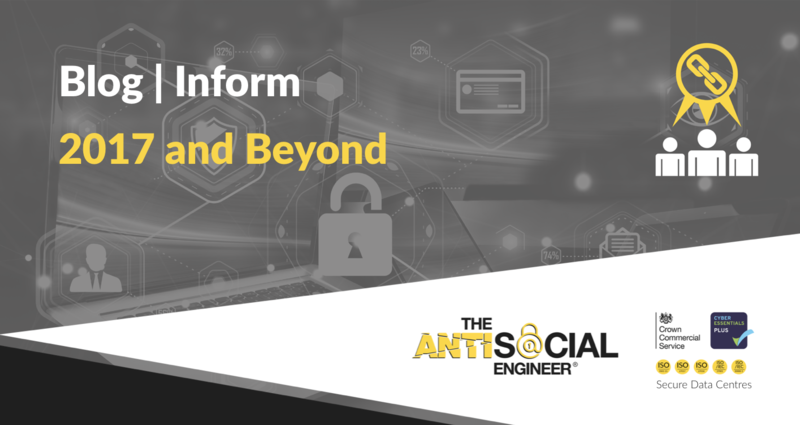 It’s been 2 years to the day since The AntiSocial Engineer Limited was founded; The seasonal timing and also the fact we seem to be doing enough right to pay the bills have made us sit down and question where we take it from here. Spoke at BSides London 2015. Reported 6 confidential cases to the ICO, involving data breaches. Had some real client site adventures, grazed more that one knee and hid in cupboards in a bank. Been in more blogs and articles then we can count. Consulted for a company that advises UK Government departments on social engineering attacks. Disclosed the TalkTalk (2015), Sage (2016) and AA (2017) data breaches due to company concealment. Been on film sets with the famous people, preaching about Vishing frauds for Natwest. Gained some cast iron friends in the industry – You know who you are! Reported over 50 private security incidents to companies, for free, so they could be safer. So we caused a few stirs and fixed some things, but what do we desire? What should we do with a business that is in need of direction? With our business head firmly on we need some new business aims and objectives to replace our first few years aims which loosely revealed around ‘keeping afloat and surviving’ – hardly pioneering or trend setting but for a smaller new business it is an often overlooked first hurdle. Gladly though this leaves us plenty of scope to work upon. For the following years, we would like to up the ante and continue to push boundaries. We need some new business aims and objectives, so here they are! To reduce victims of cyber-enabled crime, focussing on a reduction of malicious social engineering attacks. Make a profit by reducing cybercrime, enough to bring year on year a 10% growth in our business. Bring regulation to the sending of SMS messages with masked sender ID’s, the kind of messages commonly utilised by fraudsters. Continue to raise awareness of cyber security issues, highlighting the dangers of these issues. Partner with organisations that align with our business aim and can mutually benefit from our co-operation. Stay antisocial, to think differently and contrary to the information security industry as a whole. Help anyone in need of assistance, regardless of direct profit or status. Keep it ego-free, stylish if possible and low key – unless media hype is needed!